Truck Covers USA, San Diego, CA, introduces the American Rack System. Take your truck cover to a new level. Bike those mountains! Ski those slopes! The American Rack System allows you to carry all your outdoor adventure cargo without the need to take up your bed space and providing full functionality of your roll cover unit to open & close. 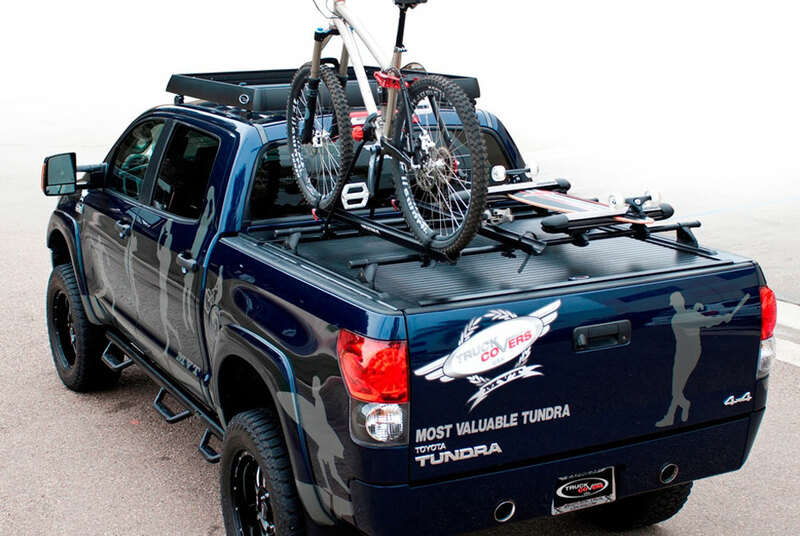 Designed and engineered for all sports enthusiasts, the American Rack System is a perfect fit along with the American Roll Cover from Truck Covers USA. The American Rack System allows multiple attachment scenarios & works with sports attachment accessories from Yakima and other manufacturers. The American Rack System is the most sophisticated rack system available. Build your own adventure. Perfect for new & existing American Roll Cover owners & customers. Another innovation from Truck Covers USA – www.truckcoversusa.com. American X-Box, Truck Covers USA’s SEMA Award Winning New Product Truck Covers USA introduces the American Work Cover Jr.